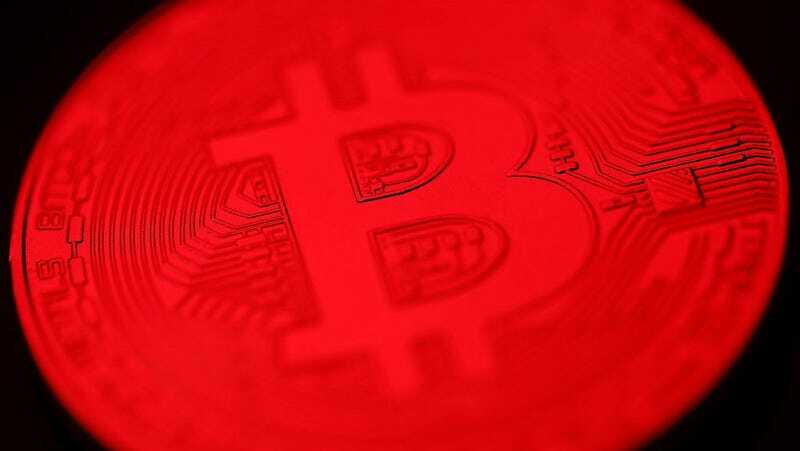 The price of bitcoin plunged on Friday, continuing a steady downward spiral that’s lasted all week. True believers are shrugging it off, but with its newfound notoriety, a lot of latecomers are feeling some pain. All but two of the top 100 cryptocurrencies were significantly down this morning. At the moment, Coinbase lists the price of bitcoin at $11,709. That figure, of course, will be different in a matter of moments. The number one cryptocurrency hit a record high of $19,857 earlier this week. It’s now down 33 percent for the week, and 41 percent for the month. Scanning the prices of the top 100 cryptocurrencies on CoinMarketCap, you’ll see those percentages echoing for all the altcoins over the last 24 hours. This kind of correction was inevitable, bitcoin tends to have one every quarter, but today’s downslide seemed especially inevitable. In a matter of two months, bitcoin’s price doubled, and then it doubled again over the course of a month. Even though doubling isn’t anything new for bitcoin, those huge prices have attracted mainstream attention and the financial markets are jumping in more and more every day. Coinbase, one of the most prominent trading apps in the US, added close to a million users in November—100,000 of them joined on a single day. With all the news in December, that number is surely higher this month. This new money has slowed the processing of transactions to a crawl. While the mainstream news has kept track of every new record set by bitcoin, the really big money this year has been in the altcoins that don’t get as much attention. At its peak this week, bitcoin was up around 2,000 percent for the year, Ethereum is up 7,400 percent at the moment, and Litecoin is up 5,500 percent. Newer, more obscure offerings like IOTA and Ripple have had similar, crazy runs. What’s different about today’s chaos is that you’ll often see bitcoin’s price swing low as people hedge on other cryptocurrencies, but today it’s all a mess. On explanation for the far-reaching crash could involve how altcoin markets work; people often use bitcoin to buy into altcoins. Many popular exchanges, like Binance or Bittrex, only deal in cryptocurrency. Newbies just dipping into the market, however, will take the easiest route to start experimenting with new tokens. That means sending dollars to buy some bitcoin on Coinbase, which uses the GDAX exchange and only trades in four cryptocurrencies, then transferring the bitcoin from their wallet to a different exchange to pick up a new cryptocurrency. Bitcoin may be slow to process, expensive, and difficult to mine, but we’re seeing clearly just how much the entire market depends on it. We’re also likely seeing the “bitcoin whales” finally cashing out. A thousand people own 40 percent of the bitcoin market and when that price edged toward $20,000, the writing was on the wall. Is today the dreaded bubble burst that bitcoin skeptics have long foretold? That doesn’t seem likely. It’s back up by $2,000 since I started writing this piece. True believers will step in and buy low and things will level out for a little bit. The real question is, will all the new players—the ones who are surely losing their shirt right now—want to pick up their ball and go home? Update: Coinbase has temporarily halted trades, you can read more about that here.